[MARQUIS DE LAFAYETTE], CHRISTOPHER MEINEKE. 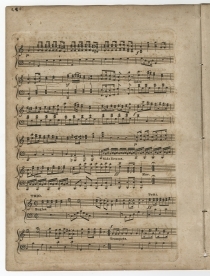 Printed Sheet Music. “General Lafayette’s Grand March and Quickstep,” Baltimore: John Cole, ca. 1824. 3 pp. When General Lafayette visited the United States from August 1824 to September 1825, he received a hero’s welcome as one of the last surviving connections to the American Revolutionary War. Invited by President James Monroe, Lafayette became the “Nation’s Guest.” Each city tried to outdo others in welcoming Lafayette, who traveled to all twenty-four states over thirteen months. Many towns and counties were named for him, and he laid the cornerstones of numerous buildings. He visited Thomas Jefferson and James Madison at Monticello and Andrew Jackson at the Hermitage. He was in Washington when the House of Representatives decided the contested election of 1824. He laid the cornerstone of the Bunker Hill Monument after hearing an address by Daniel Webster and spent his sixty-eighth birthday at a reception with President John Quincy Adams at the White House. During Lafayette’s tour, nearly three million people, or about one-quarter of the nation’s population, saw him. 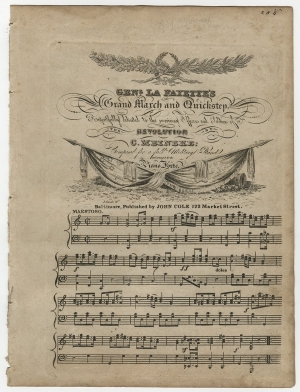 Composer Christopher Meineke dedicated his “General Lafayette’s Grand March and Quickstep” to “the surviving Officers and Soldiers of the Revolution.” Meineke composed the piece for a full military band and also arranged it for the piano forte, and John Cole published it in Baltimore. Christopher Meineke (1782-1850) was born in Germany and immigrated to Baltimore, Maryland, in 1800. He became a naturalized citizen in 1827. Some accounts say he visited Europe in 1817 and met Ludwig von Beethoven, who praised his concerto. He served as organist and choirmaster at St. Paul’s Episcopal Church from 1819 until his death. Meineke was a prolific composer, who published piano variations, dances, marches, hymns, and other church music. John Cole (1774-1855) was born in England but emigrated to Baltimore with his family in 1785. In 1802, he became a printer and compiled nearly thirty different collections of sacred music for various religious denominations. 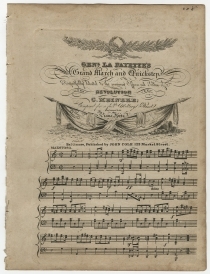 In 1822, he opened a music shop and became the most important seller of sheet music in Baltimore, publishing more than 200 popular selections between 1821 and 1825. He was also a skilled musician who played several instruments, especially the clarinet, and directed a marching band. Cole continued as a sacred music publisher until his death, but in 1839, he sold off his secular music business. 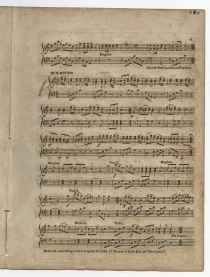 Cole was the first American publisher to include a picture on the title page of published sheet music. Gilbert du Motier, Marquis de Lafayette (1757-1834) was born in south central France into an aristocratic family. Commissioned an officer at age 13, he traveled to America to participate in the American Revolutionary War. Commissioned a major-general, he initially had no troops to command. He was wounded at the Battle of Brandywine but organized an orderly retreat of his soldiers. He returned to France to seek additional support for the Americans and returned in 1780. He was given a senior command in the Continental Army and delayed British General Cornwallis’ troops in Yorktown until other American and French forces could arrive for the climactic siege. He returned to France and was appointed to the Assembly of Notables in 1787 and elected to the Estates-General in 1789. As commander-in-chief of the National Guard, he tried to steer a middle course through the French Revolution, but radicals had him arrested and imprisoned for more than five years. Napoleon Bonaparte obtained his release in 1797, but he did not participate in Napoleon’s government. After the restoration of the monarchy in 1814, he became a member of the Chamber of Deputies. In 1824, at the invitation of President James Monroe, Lafayette visited each of the twenty-four United States and received a hero’s welcome. “The Nation’s Guest,” Nile’s Weekly Register (Baltimore), October 16, 1824, 108.